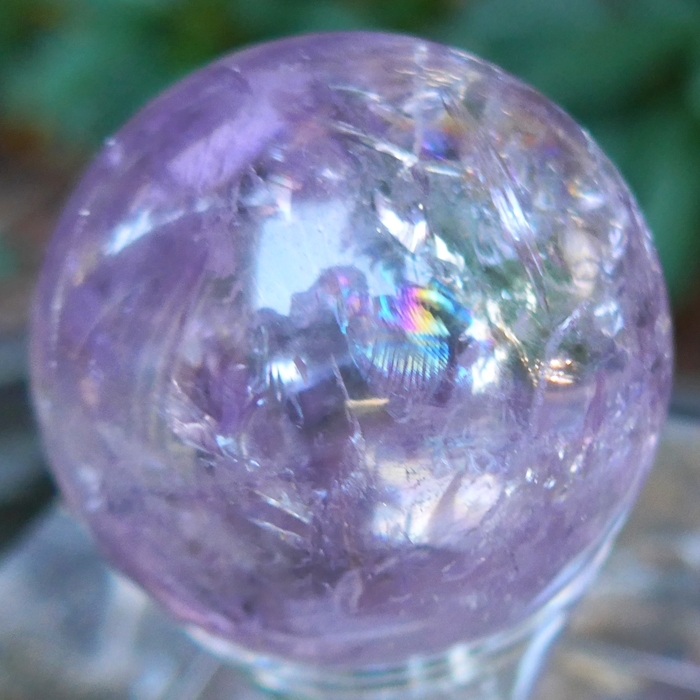 Dimensions (HxWxD): 1.75" x 1.75" x 1.75"
This highly translucent Violet Rainbow Amethyst Sphere, is polished and translucent with a diameter of 1.75 inches and exhibits a rich variety of violet and lavender hues which hold & refract light. 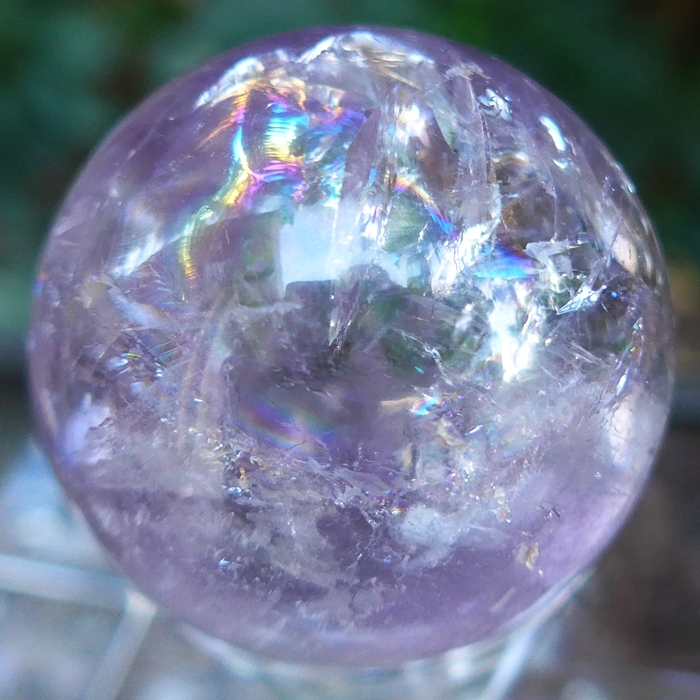 This gorgeous sphere like most amethyst has inclusions, one or two of which reach the surface. It has ice, rainbow, veil, cloud & frost inclusions & a wonderful array of colors from deep violet to translucent lavender. Crystal balls conjure images of witches, warlocks and spells. But modern day spiritual seekers understand that the crystal ball is a microcosm, a doorway, a transmitter and receiver of energies and a very valuable ally for those involved in divination or meditation, and all those who want to strengthen their intuitive powers. Natural quartz crystal balls are cut from veins of quartz. Crystal balls usually have inclusions or veils. Rainbows, metallic flakes, and milky clouds are often found inside crystal balls. In traditional crystal ball divination, the holder of the ball has cleared the stone of all outside energies and hands it to the questioner. The querent passes energy into the ball and returns it to the holder. The holder then enters into the ball, metaphorically speaking, meditating upon the interior until inner spiritual guidance provides the appropriate information about the querent and the question. The inclusions within the crystal often function to create an imaginative landscape and a backdrop for the emergence and retreat of meaningful, symbolic forms, such as are often found in clouds, bonfires or running water. Amethyst is the gemstone variety of quartz, produced by the presence of manganese in clear quartz crystal. Increments of iron within the crystal as it formed vary the color of the amethyst, which ranges from pale lilac to deep purple. Amethyst has been popular with royalty, sages, mystics and magicians for centuries. “Fine amethysts are featured in the British Crown Jewels and were also a favorite of Catherine the Great and Egyptian royalty,” according to the International Colored Gemstone Association. “Leonardo Da Vinci wrote that amethyst was able to dissipate evil thoughts and quicken the intelligence,” according to the ICGA website. Amethyst is said to enhance spirituality, raise the vibrational level of the holder, cleanse the astral, etheric and physical bodies, and produce a peaceful, tranquil state of mind. 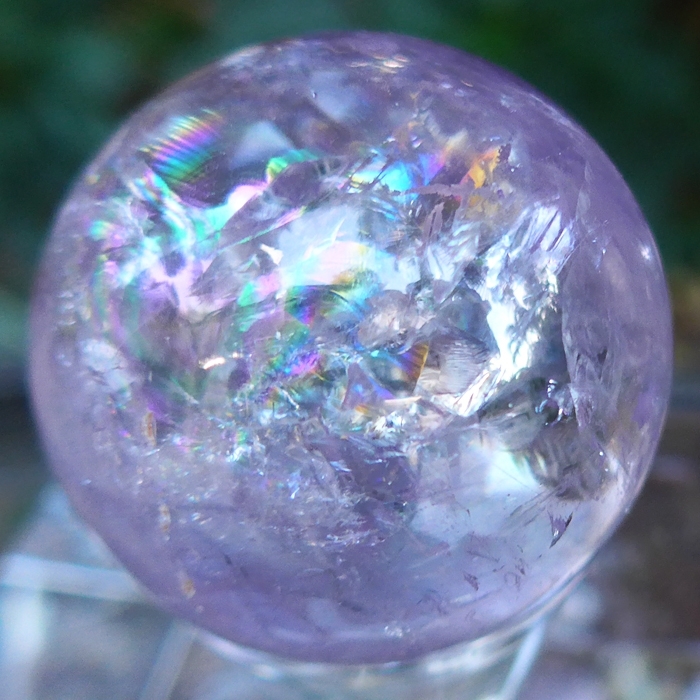 The color violet is associated with the crown chakra in the Western chakra system, and so this extremely bright violet amethyst is said by crystal healers to activate and energize the crown chakra, connecting the bearer to Higher Mind, Higher Realms and inner spiritual guidance from extremely elevated and reliable Sources. We use amethyst as a spiritual purifier, a way to protect the etheric body from outer stresses, be they of a spiritual, mental, physical, personal or impersonal nature. Amethyst is classically the stone of sobriety, purity and chastity and would be an excellent stone for those with tendencies toward addictive behavior, or for those spiritual seekers intent upon transformation through the progressive purification of mind, body and aura. The color of amethyst is violet, the color of the seventh, or crown chakra, in the human energy body, and the Violet Ray is the Seventh of the Seven Rays of Creation. The Seventh Ray is one aspect of the Holy Spirit, a combination of the blue flame of faith and the pink flame of love. 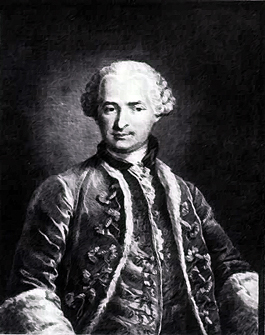 The Ascended Master who is Master of the Seventh Ray is Count St. Germain, the eighteenth century reincarnation of the Western Mystic and Adept Christian Rosenkreuz, apochryphal founder of the Rosicrucian Order. The Seventh Ray focus greatly on the use of ceremonial magic and alchemy to purify and transmute the lower, animal instincts of humanity into higher impulses, higher thought-forms, more evolved emotional states, and more purified energetic signatures at all levels of being. In the pantheon of modern day New Age Guides and Teachers, the Count Saint Germain is called "The World Teacher" and "The Master of the Violet Ray" and is thought to communicate mind-to-mind with many, many students around the world. There is thought to be a large contingent of his students alive today in the United States, the center of modern Empire, just as Paris was the center of European Empire at the time of St. Germain. Many New Age students of St. Germain utilize crystals and gemstones in their spiritual practice, for healing and in meditation, in a modern alchemical quest for Higher Self, Higher Mind and Higher Purpose. Modern New Age practice encompasses a belief in the theory of karma and reincarnation. The belief in reincarnation has its roots in the Hindu and Egyptian Mystery School traditions, and is fundamental to the Greek Mystery School Tradition of the pre-Socratic philosophers, as we discuss at great length in the online E-Book Spirits of Stone: A Lightworker's Guide to Crystals for Healing and Meditation. New Age students of the Ancient Wisdom Teachings often utilize crystals and gemstones, along with meditation techniques, Reiki and past life regression therapy to access memories of past lives, and to release the detrimental patterns of behavior, negative emotions and outmoded mental maps of the world imprinted in our cells, our hearts, our minds and our karma from traumas experienced aeons ago. Many of these modern acolytes of the Great Alchemist utilize crystals and gemstones thought to resonate with the energy vibration of the Violet Ray, under the guidance of Master St. Germain for purification and to raise the kundalini energy in a quest for Unity Consciousness. Such crystals and gems include especially amethyst, that violet colored form of quartz once so favored by the Pope and Bishops of the Catholic Church. Note: Above weight is shipping weight. Net weight is 96 grams or 3.4 oz.